You can call them what you want to. In the analyst community, they’re briefings. The best ones provide value on both sides: to both the analysts and researchers, as well as to the tech firm (or in my case, agency or publisher, too, as I cover advertising and media). We analysts conduct briefings to further our research agendas. We constantly monitor developments and companies that operate in our sphere of coverage. We’re looking for trends and patterns, for case studies, and often, to make introductions or connections between businesses or people operating in the same sphere who really ought to know one another. (This has more than once led to investments, acquisitions and partnerships.) Analysts are influencers and a form of media; we might write about your clients or business model, or highlight one of your case studies in a speech or webinar. The big tech players have analyst relations departments to keep the briefing machine well-oiled. Yet a surprising number of start-ups and even well-established firms are unfamiliar with the briefing process. So herewith, some insider tips to get the most out of this very important component of a communications strategy process. In the three and a half years since I joined the Altimeter Group, I’ve conducted hundreds of briefings with companies large and small, all active in digital marketing, advertising, and media. 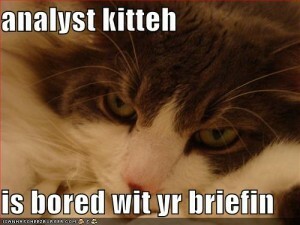 My Fridays are pretty much reserved for briefings. Briefing calls are scheduled from morning to night, generally starting in Europe and ending somewhere in Silicon Valley. We all limit briefings to 30 minutes to keep them on-topic, and almost never conduct them in person. Most companies requesting briefings ask to do them on site, but travel time is a luxury. It would radically curtail the number of companies with whom we’re able to talk. At Altimeter, we have a system for sharing tagged, cloud-based briefing notes that puts all briefing information at the fingertips of all the company’s analysts and researchers. That makes our jobs easier when we’re trying to find information on specific types of companies or business, and benefits the companies we speak with, too. They’re made more visible to more people. The above illustrates the value exchange of a briefing. Yet compared with the hundreds, if not thousands, of briefings I’ve conducted as both a journalist and editor, I’m too often disappointed at how many companies that brief me now that I’m an analyst fail to take full advantage of an opportunity that could benefit us both. Some suggestions for getting the most out of an analyst briefing. Half an hour goes quickly. I begin every call by telling callers at exactly what time I have a hard stop. Please don’t be late. Don’t focus on the information available on your website. I’ve already read it. Too many briefings end with revealing the really new and compelling idea two minutes before our call ends and the next call must begin. Don’t bury the lede. Five executives on a call are at least three too many. Again, those 30 minutes elapse quickly. Everyone wants the opportunity to talk. This results in too much noise and very little signal. Provide names, titles, and email addresses of who will be on the call — in advance. We can look up their bios and LinkedIn profiles. This saves a ton of time on intros, and allows me to prepare better, more focused questions. PR people, take particular note. If your name is on the call invitation, but not your client’s, I won’t dial in. Provide any deck, presentation materials, or online meeting URL at least one day in advance. The sheer number of companies that send presentation materials literally seconds before (sometimes, during) a briefing is Pet Peeve No. 1. A company did this last Friday via a service that required me to establish, then verify, a new user account in order to download their materials. It’s unfair (not to mention impossible) to ask an analyst to do this in what’s often literally a 45-second window between two briefings. Let’s both agree to be locked, loaded, and ready to go when our briefing is scheduled to begin. Don’t assume we’re online for the presentation. Probably we are. But it’s not unheard of to conduct a briefing from an airport gate or at a conference with subpar wifi. So really do send those show-and-tell materials in advance. Please talk clearly and into the phone. Please talk directly into the phone (not the speakerphone), particularly if one of us is speaking a non-native language. We’re trying to understand one another. The analyst is also taking notes. A briefing is not a speech, it’s a conversation. In briefings I far too often can’t get a word in edgewise, and I’m a person not known to be shy about piping up. Some executives get on a roll and cannot — will not — be stopped until they’ve delivered a message from beginning to end. (Most often, they’re working from a deck and a bit nervous, which they try to cover by being overly verbose.) A briefing is a presentation, but it’s also a conversation. The analyst has questions, as well as a research agenda. So pause. Make an effort to throw in questions such as: Any questions? Is that clear? Does this relate to any research projects you’re working on now? Try to make the briefing even more relevant to the analyst than they hoped it would be when they set it up with you. Listen to us, too. We analysts make our living as strategic, research-based advisors. We’re very well connected and ahead-of-the-curve informed about the industry sectors we microscopically cover. A briefing is hardly an advisory session, but we may well make an observation, comparison, or remark that could serve you well. Listen for those nuggets. Go through the proper channels. Every day I send over a dozen canned responses to the briefing requests I receive personally from companies and PRs alike. I won’t accept an emailed request for very good reasons. Like most analyst firms, we have a briefing request form that is designed to capture the information we need to determine if we’ll accept a briefing. Moreover, the form alerts all my analyst and researcher colleagues to the opportunity, so one briefing (if accepted) potentially goes much further inside the company. It also greatly streamlines the scheduling process on our side. That’s it from me. What about companies out there that are veterans of analyst briefings? How can we make briefings easier, better and more valuable for you?